Your pets dental health is VERY important to their over all health. Many seemingly unrelated medical issues can arise from poor dental health. During your pets annual exam, Dr. Lanford or Dr. Knirk will assess the dental health of your pet and may recommend doing a dental cleaning. 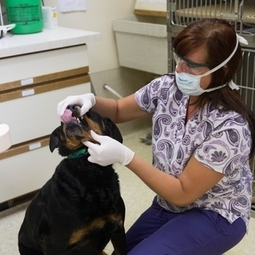 Learn why your pets dental health is so important! We will call you the day before the procedure to confirm your pet's appointment. At this time we will tell you that your pet should not have food after midnight the night before the procedure. The morning of the dental we will have you drop your pet off between 8:00 - 8:30 am. We understand this may be difficult for some families, so please let us know if you would like to drop your pet off the night before at no extra charge. During the procedure your pet's heartbeat, breathing and pulse will be monitored. Gas anesthesia is used during the entire procedure. We give your pet an injection of antibiotic prior to dental work to prevent any infection. The teeth are scaled and polished just as if they were to go to the dentist. Your pet will be monitored by a technician while they wake up from anesthesia. This helps us catch any adverse reactions before they become a problem. Once the dental procedure is complete and your pet is fully awake, we will call to let you know when they are able to go home. In most cases your pet is able to go home the very same day. Ask about the special products we carry in our pet store that help maintain their new smile!